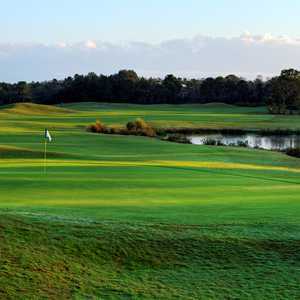 NEW SMYRNA BEACH, Fla. -- More golf courses should be like Venetian Bay Golf Club, located along the Space Coast of Florida. 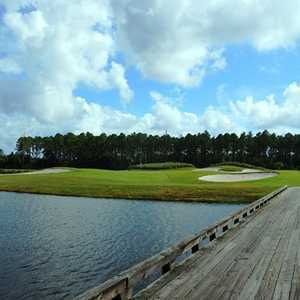 Plenty of water and plenty of fairway are the trademarks of Venetian Bay Golf Club. The Club at Venetian Bay is part of a unique residential community with a Mediterranean theme. Colorful buildings, mosaics, and Mediterranean vegetation surround the championship golf course. The biggest challenge for the designers was transforming what was formerly a cow pasture into a lush, challenging course. Wide fairways, excellent conditioning, plenty of interesting holes -- what's not to love? With water on more than half the holes, this George Clifton design isn't a pushover, especially if you play it from the back tees at 7,078 yards. But you won't look for many golf balls either. Keep it out of the water, and you'll most likely find the fairway or at least the light rough. "That's why people who play the blue and white tees love it," said Lenny Varacelli, head professional at Venetian Bay Golf Club. "If you have a day off, why would you want to get beat up?" The course record is 63 by Mark McCumber, but most mortals will have a hard time avoiding a hiccup with all the water on the course. There are some difficult holes, and scoring still involves hitting precise shots and making putts. Still, this is the ultimate in playability. From the get go, it's evident that you can free wheel with the driver, and there are opportunities to score. The first hole is a wide-open, reachable par 5. Water comes into play on the second shot, but you have to be really wild to reach it. 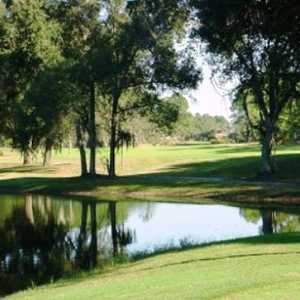 But here's the deal: While there are some relatively easy holes, there are some pretty challenging ones, too, on this layout, a former cow pasture that plays through woodlands on the front and more exposed holes on the back. The second hole is a 447-yard par 4 with another wide fairway but some troublesome fairway bunkers to complicate matters. There are, in fact, 144 bunkers, which matches the number of acres this large layout sits on. Those bunkers come into play big-time on the par-4 eighth, but they aren't super difficult to play from either. Players with skills usually draw a good enough lie to reach the green. Still, there are challenging holes -- such as the 12th, a medium-length par 3 that's all carry. Or the next hole, a 458-yard par 4 with bunkers, a grove of palm trees and a prevailing wind that makes play even longer. And then there's the 18th, with large fairway bunkers and water that come into play on the tee shot and approach. Not only are the fairways wide and the conditioning excellent at Venetian Bay, but the club has excellent amenities as well. A large driving range has a very private club feel, and it's accented by a large short-game area, including putting green, chipping areas and practice bunkers. The club's large Mediterranean clubhouse is also a great place to hang out after a round or simply to come in and watch sports. The bar has NFL Ticket, so in the fall, it attracts plenty of football fans on the weekends and on Monday nights. It also offers some pretty good bar food -- the cheeseburger is excellent -- as well as a wide variety of beers and drinks. The star, however, is the golf course, which has no shortage of fun. All of it makes for a great way to spend four hours or more.